■Measurement for solvent concentration is easy by measuring the head space gas with the detector tube. 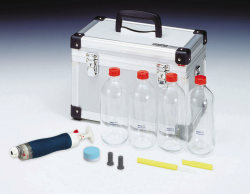 Immersion method： Uses capillarity by immersing a part of detector tube into the sample liquid. 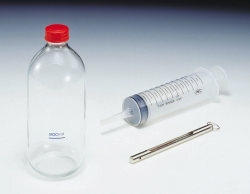 Suction method： Suction of the sample liquid into the detector tube by attaching a rubber ball on one end of the tube. Injection method： Injecting the sample liquid into the detector tube by a syringe.